General Blog: How do I add sites to my Allowed Sites list? How do I add sites to my Allowed Sites list? 1. Log in to your account at https://www.google.com/adsense. 2. Click the AdSense Setup tab. 3. From the links below the tab, choose Allowed Sites. 4. Select the option to Only allow certain sites to show ads for my account. 5. The resulting page will display the URLs currently included in the Allowed Sites list for your account. If this is the first time you've used the list, the text box will be empty. 6. 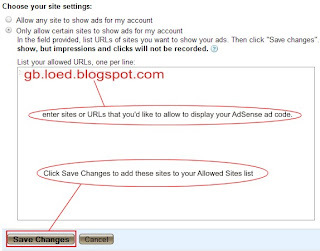 In the box, enter sites or URLs that you'd like to allow to display your AdSense ad code. 7. Click Save Changes to add these sites to your Allowed Sites list. It usually takes about 4 hours for your changes to take effect. However, under certain circumstances, it may take up to 48 hours for your changes to take effect. Sites or URLs that are not on the Allowed Sites list will not report clicks or impressions and you will not receive earnings from them, so please be sure to keep your list up to date.